I’m maybe the biggest fan of chilled soups there is. Why not? They’re (often) easy to make, flavorful, healthy, refreshing… And if you have only some imagination, it’s pretty a versatile way to feed people during the warmer months. 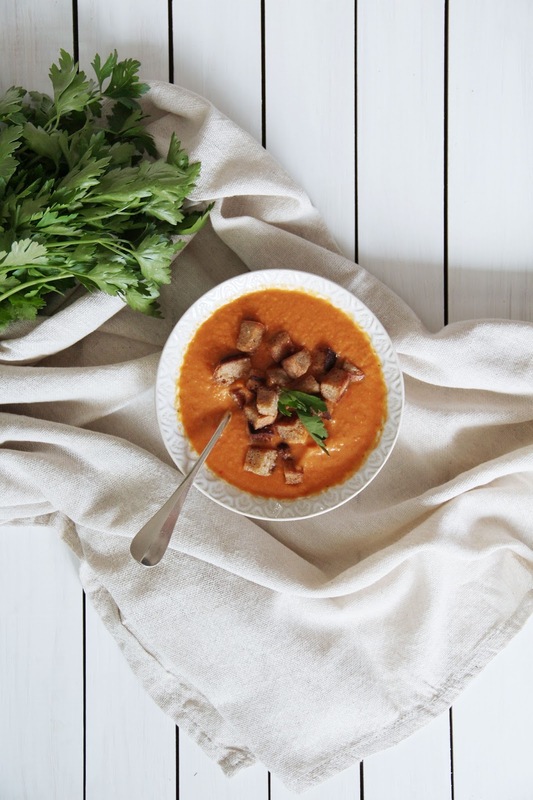 And here’s another one: a gorgeous roasted Gazpacho with sourdough bread. Wes, it’s as good as it sounds. [gap height=”20″]A friend of mine, Nelson, pointed out to me (after i posted my last Gazpacho), that his granny was famous for the best Gazpacho, and, as it appears, she always added a bit of (stale) bread to the mix for texture and depth. I have seen recipes before that feature bread in cold soups, somehow I just never added any to my own versions. Soon after his tipp, though, I couldn’t help but pick up a sourdough on my next groceries run, for the ultimate test. And guess what? A bit of sourdough goes a long way. 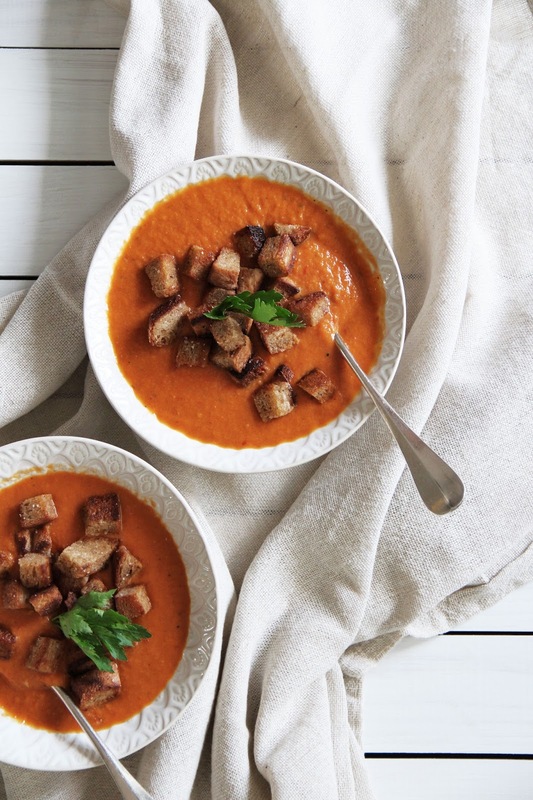 It will make your next gazpacho smooth and a bit fancy but also just so very comforting (carbs, go figure). 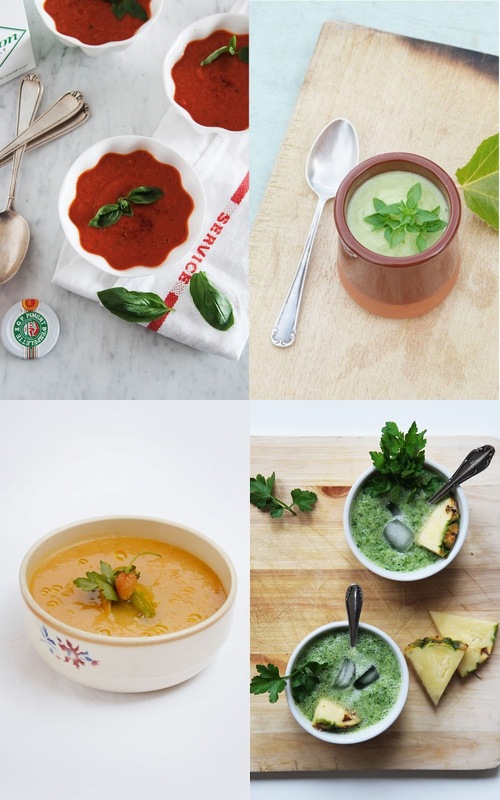 That being said, I know it might get boring for some, but for me it never does, so above there’s a roundup of my favorite chilled soups (last picture, from left to right). Aaaand… you’re dismissed! Wishing you all a splendid weekend, wherever you may be. 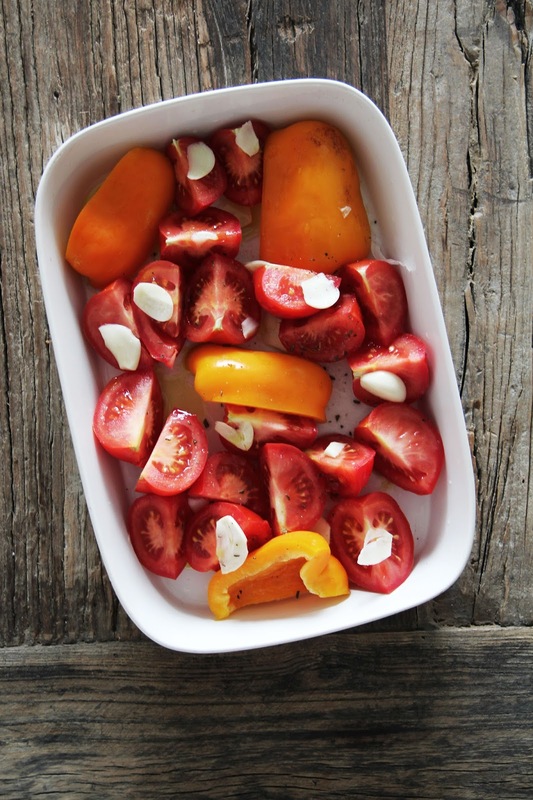 Put the tomatoes, pepper and garlic in a heat prove pan and brush with 2 tablespoons of the olive oil. Sprinkle with some salt. Roast at 220 C / 400 F for 25 minutes, until the tomatoes are brown and the peppers have blisters. The scent will be heavenly! let the vegs cool a little before removing the peppers’ skins (by hand). Put everything (including the juices from roasting) in a blender, add the broth, parsley and the rest of the olive oil and blend well. Add the sourdough bread and puree some more. season with lemon juice, harissa and some salt. Cover and refrigerate for at least 2 hours. For the croutons, heat the butter and olive oil in a pan. Fry the bread cubes in it until they’re nicely brown and crispy. Add the garlic at the end and fry for a minute or so. season with salt. Stir the gazpacho well, season once more if necessary and divide between bowls. Garnish with the still warm croutons and serve.